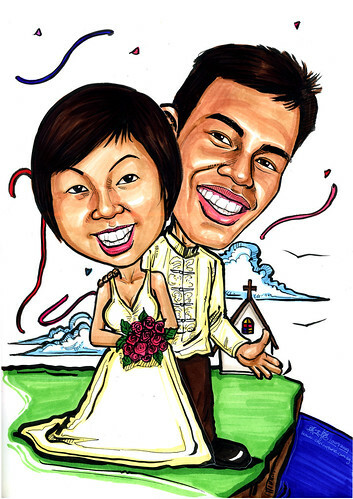 I would like to order a caricature done for my wedding, we are going to use the caricature to make it into a jigsaw puzzle so that it can be our guest book. Attached please find pictures of us, and similar designs of the wedding attire we would be wearing, for the groom, it's a traditional Philippine Barong, and for the bride it is a v-neck gown. We are holding our wedding in Bali at a chapel on a clifftop overlooking the sea. Also just to give you an idea, the color theme of the wedding is chocolate brown and pink." Few more similar orders due in the next few days.